I’ve been hearing about mashed cauliflower recently and I haven’t given it a try yet. Apparently it’s a craze right now to use it instead of potatoes, I suppose to cut carbs and such. Potatoes are good for you! 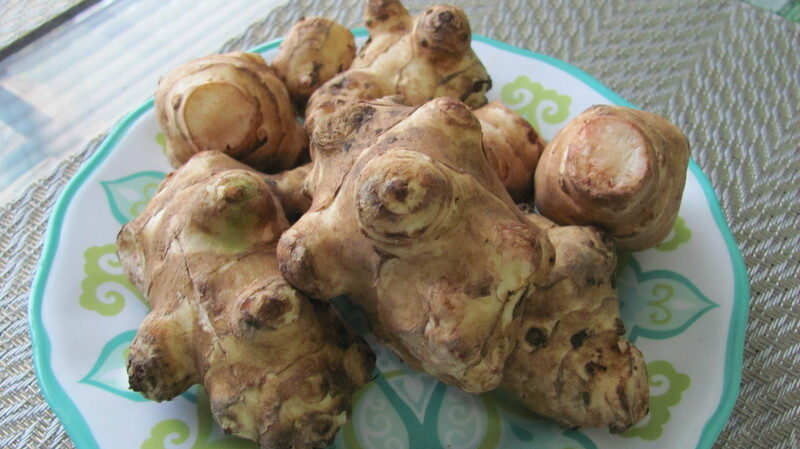 Anyway…I’d heard of Jersusalem artichokes before, also known as sunchokes, but I had no idea what they were or how to cook them. So, naturally, I bought them. I did a little research to find out what they are all about. Sunchokes are the root of a particular species of sunflower. The root looks a lot like ginger, but much larger and slightly less yellow in color. The flesh is the same color as raw potato, but has a texure similar to jicama, also known as a Mexican turnip or yam. Jicama is a sweet root, while the sunchoke yields a more earthy flavor, yet still slightly sweet. I tried it raw and needless to say, I was even more excited about transforming them into mash. Peel the sunchokes and chop into medium-sized pieces. The smaller the pieces, the faster they will cook and softer they will be. Steam on the stove to for about 20 minutes, or until soft and easy to mash with a fork. Let cool about 5 minutes. Carefully transfer from the hot pot to a large mixing bowl and mash with a potato masher and a fork until desired smoothness is reached. Mix in chopped green onion, sour cream, salt and pepper. Mix thoroughly. You can leave it a little chunky like I did so it’s more like a hot “potato” salad, or mash it really well so it’s more like mashed potatoes. It could also be served chilled like traditional potato salad.